Note: These are quite easy but do require patience and caution at times. The most challenging part was scooping out the potato flesh because you want to be careful not to scoop too close to the skin and puncture it. It's very easy to double this recipe, if necessary. Position rack in center of oven and preheat to 375°F. Rub oil over potatoes. Pierce in several spots with fork. Place directly on oven rack and bake until tender, about 45 minutes. Transfer to rack and cool 10 minutes. Using a hand towel, cut off top 1/4 of each potato with a serrated knife. Using spoon, carefully scoop out potato, leaving 1/2-inch-thick shell. Transfer potato to large bowl. Repeat with remaining potatoes. Mash potatoes with a fork or potato masher until smooth. Mix in cheese, then half and half, butter, and chives. Season with salt and pepper. Position rack in center of oven and preheat to 375°F. 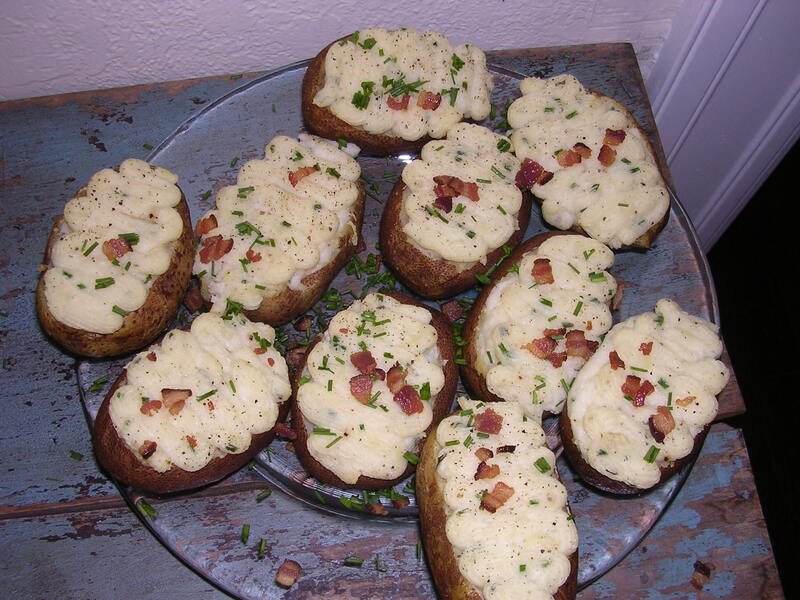 Bake potatoes until filling is heated through and tops brown, about 20 minutes. Sprinkle with fresh pepper, chives and bacon bits.